Which is More Frightening, a World With or Without Nuclear Power? Today on the BBC World Services radio programme HARDtalk, we heard an interview with John Ritch, Director General, World Nuclear Association and Sven Giegold, a leading German Green member of the European parliament. Host Stephen Sackur asked his guests to discuss the impact of Fukushima on the global nuclear industry. Ultimately the question is: Which is more frightening, a world with or without nuclear power? TalkNuclear knows nuclear energy is an affordable, available and reliable source of energy that will allow us to meet our growing energy demands while addressing climate change since it doesn’t contribute greenhouse gasses or smog to the atmosphere. More than energy production, Canadian nuclear in particular has pioneered, and continues to develop, many important medical technologies which have saved and improved the lives of millions around the world. We know what world we’d rather live in: Nuclear power? Yes please! Listen to the interview and let us know what you think. Last month we told you about the 2011 International Nuclear Energy Olympiad, an international student competition seeking innovative ways to communicate nuclear technology for public buy-in. the overall quality of the submissions was exceptionally high making it extremely hard for the Committee to select only 10 teams. We at TalkNuclear are very proud to announce that the team of CNA summer students, Alex Wolf and James Harrington, was one of those 10 teams selected to present their plan. Of their plan, Alex and James say: Showing people all the great things about nuclear energy is a complex task. It would be simple to provide widespread education on radiation science and nuclear safety, however not everyone has the time to devote to learning these topics. Different stakeholders have different needs, and our plan will focus on identifying these groups, listening to their specific concerns, and sharing relevant information through direct and word-of-mouth strategies. “We’re very happy to among the ten teams selected to present a plan for gaining public acceptance of nuclear in Canada,” said Alex. “We’re also looking forward to hearing what the other teams from other countries are proposing based on their perspective and experience with nuclear,” added James. diversity of subjects read by the candidates. Congratulations Alex and James! Your selection exemplifies the on-going success of the Canadian nuclear community’s commitment and focus on industry renewal and knowledge transfer. Best of luck at the Olympiad in South Korea in September! The names of the selected teams have been posted on the Olympiad website. Alex Wolf has been close to all things radiation since 2003. He currently serves as a Project Analyst at the Canadian Nuclear Association, where his primary role is in developing and marketing CNA external events, including the annual CNA Conference and Tradeshow. Prior to this, Alex worked as a tour guide at the McMaster Nuclear Reactor while completing his M.Sc. in Radiation Biology. He also received his certification as a Registered Radiation Therapist after completing his Bachelor’s Degree in Medical Radiation Sciences in 2008. Alex has a strong interest in international energy and health policy, and is currently completing his MBA at the Schulich School of Business at York University. James Harrington joined the CNA in May of 2011 after graduating from McMaster University in Hamilton with a B.Eng Society degree in Engineering Physics. His specializations include a broad range of engineering sciences ranging from energy systems, nuclear power and radiation and radioisotope methodology all the way to sustainable development. James’ work with the CNA is focused on the development of an education portal to increase awareness with regards to radiation and the associated health effects. The CNA recognizes McMaster University for their assistance in bringing James on board. July 15, 2011 — The Refurbishment Project team has successfully completed the installation and testing of all 380 calandria tubes in the reactor vessel. The NB Power and AECL teams continue to work around the clock to complete all project activities safely and with the quality expected by New Brunswickers in order to complete the retubing work by May 2012. After the commissioning activities are completed, the Station is expected to return to service by the fall of 2012 and deliver safe and reliable power to New Brunswick for the next 25 to 30 years. Rod Eagles, NB Power Refurbishment Project Director, says that the early completion of the calandria tube installation is a result of the commitment of every man and woman working on the project. The calandria tube installation activities involved 380 tubes being inserted horizontally into the calandria vessel with 760 tube inserts (one at each end). The calandria tubes were tested individually at each end to ensure that leak tight seals were achieved and all tests were successful. 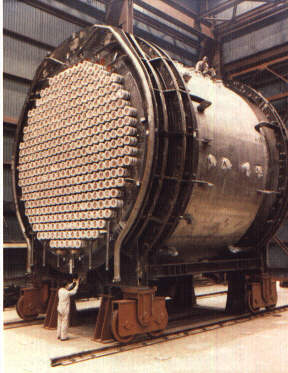 These tubes are approximately six metres long and 13 centimetres in diameter, and will contain the reactor’s fuel channels and fuel bundles. Workers are preparing for the fuel channel installation activities which are expected to be completed in December 2011. This sequence will include the installation of pressure tubes, spacers, end fittings and positioning assemblies as well as bellows welding. Activities to restart the Station continue. NB Power has a team in place to ensure that the remaining commissioning activities are carried out in accordance with all operating and regulatory requirements. Planning for the 2012 Canadian Nuclear Association Conference and Trade Show is currently underway! The theme of this year’s conference is Leadership Through Innovation. We will focus on the latest developments in nuclear technology as well as unique communications strategies that help share the excitement with the rest of the world! The preliminary Conference program will be available on August 2nd. If you’ve never attended the CNA Conference and Tradeshow, make sure to check out the programs and speakers from past years’ events. The 2012 Conference is the premier event for the Canadian nuclear industry. Do not miss it.